If you’re looking for better health, you may have to look no further than your mouth. That’s right, your mouth has a huge impact on your overall health. Whenever something goes wrong with your teeth or your oral health, it can affect other parts of the body—sometimes profoundly. Likewise, imbalances elsewhere in the body sometimes manifest as problems with the teeth and mouth. Therefore, caring for your oral health is about much more than a pretty smile—at least it should be. “Most people don’t understand that problems with your teeth—from impacted wisdom teeth to bite problems—can greatly affect your total health,” says Mark Breiner, author of Whole-Body Dentistry®: A Complete Guide to Understanding the Impact of Dentistry on Total Health). Dr. Breiner and his team use leading-edge technology alongside integrative strategies to give patients beautiful smiles and healthy mouths. Here are ten insights from Dr. Breiner that most people don’t know about their teeth and how they relate to your overall health and wellness. Sometimes periodontal disease is more than just bone loss. It is well documented that patients with periodontal disease have a higher risk of heart problems, stroke, premature birth, and more. This is why it is so important to look at a sample of your plaque under a microscope to determine if you have good or bad bugs present. Your gums may look healthy, but a bad slide indicates another type of hidden infection. Today, periodontal disease is often treated by using dental lasers to generate new bone. Other natural therapies, such as supplementation, oil pulling, homeopathics, irrigation, and in-office ozone therapy, are also helpful. Tooth pain is often caused by energetic interferences in the body. Here’s what that means: Every tooth and its surrounding structures are located on an acupuncture meridian and relate to specific organs, vertebrae, and muscle groups. An unhealthy or root-canaled tooth can interfere with the energy flow along the meridian and can affect those associated organs and tissues. However, it is a two-way street, and sometimes tooth pain is being caused by an organ problem. As previously mentioned, tooth pain can be caused by an energetic interference along the body’s meridian pathways. It’s important to understand this relationship, because sometimes root canals are performed unnecessarily. When a root canal is performed and there is still pain, another root canal may be performed. Ultimately, there is no pain relief, because, in fact, the underlying problem was not the tooth, but the associated organ. Addressing the root cause of pain is crucial in avoiding unnecessary and ineffective procedures. Root-canaled teeth are dead teeth, and they give off potent toxins. If your immune system cannot quarantine the toxins, research shows that they go out into your system and can cause many diseases, including heart disease, stroke, arthritis, and much more. In fact, one study showed the DNA of pathogens typical for root canals and for periodontal infection were present in the blood clots of patients with acute myocardial infarction! There are two main kinds of hidden dental infections that can wreak havoc on your health: teeth that are dead and tooth extraction sites in which areas of the bone never healed—also known as cavitations. Teeth that are dead and asymptomatic can go undetected without a thorough screening. However, they can be even more toxic than root-canaled teeth! Treatment is either a root canal or extraction of the dead tooth. And in cavitations, the segments of dead bone are very toxic and can cause a whole host of symptoms similar to the symptoms root canals may cause. The usual treatment is surgical debridement of the area; however, with injections of ozone gas and use of homeopathics, surgery can usually be avoided. So-called “silver” fillings are about 50 percent mercury. Mercury, in any form, is toxic. The mercury escapes these fillings as a vapor and reaches all of your cells. Anything that stimulates the fillings, such as brushing or chewing or removal of the fillings, substantially increases the amount of mercury vapor. Concerned about the toxic effect of mercury fillings, the European Parliament recently voted to ban the use of amalgam fillings in children under age 15, in pregnant women, and in nursing mothers. “When dissimilar metals are placed in a saltwater solution like saliva, an electric current is generated,” says Breiner. “Mercury fillings and other metals in the mouth sometimes generate enough current to interfere with your meridians. Nine out of ten children suffer from symptoms associated with sleep-disordered breathing (SDB). Improper jaw development can result in a restricted airway, causing SDB. This is often the result of prolonged bottle-feeding, pacifier use, thumb-sucking, a tongue-tie, or heredity. SDB is often the underlying cause of ADD, fatigue, bedwetting, behavioral problems, speech impediment, poor school performance, and more. The temporomandibular joint is the joint in front of your ear. When jaw relationship problems are not corrected in childhood, as an adult this usually leads to TMD and continued airway problems. Associated symptoms are headaches, migraines, dizziness, neck and backaches, and sleep apnea, among other things. Sleep-disordered breathing problems in adults are related to higher incidents of hypertension, heart disease, stroke, cancer, and more. When TMD is treated properly, the jaws are placed in their proper position and relationship and are allowed to obtain their full expanse. This results in physiologic harmony of the entire jaw, skull, and musculature, which has a profound impact on one’s health. Fluoride is a toxic poison that is found in many toothpastes and mouthwashes and is used by many dentists today. It is even placed in drinking water, as a drug to reduce tooth decay. This is especially problematic, because everyone receives the same amount of this poison per ounce—from a 10-pound formula-fed infant to a 200-pound adult! This drug is not without side effects. Fluorosis (white spots) of the teeth, lowering of IQ, increased cancer rates, increased ligament damage, and more can result from fluoride use. 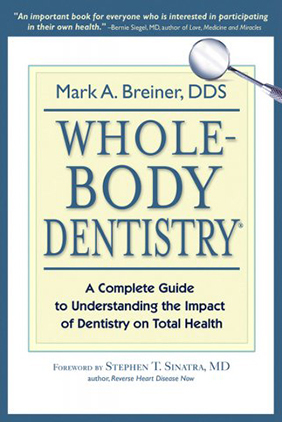 Mark A. Breiner, DDS, is the author of Whole-Body Dentistry®: A Complete Guide to Understanding the Impact of Dentistry on Total Health. He is a pioneer and recognized authority in the field of biological and holistic dentistry. Dr. Breiner practices dentistry in Fairfield, Connecticut. For more information, visit www.wholebodymed.com.